It’s almost impossible to talk with Darra Goldstein ’73 without salivating. She has a knack for spouting out mouth-watering descriptions of even the simplest foods: her Russian grandmother’s rugalach, her first thick slathering of freshly churned butter after growing up in a margarine household, a recipe for "the most amazing cheesecake I had ever tasted" scribbled on the back of an envelope by a casual acquaintance at a party (she still has the envelope; the acquaintance is now her husband). She seems to have a food memory associated with everyone she knows — like her Vassar roommate, who had a crock of tutti-frutti on the windowsill at all times. 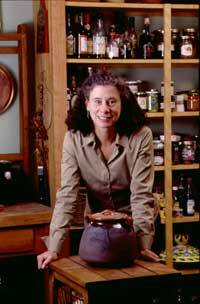 Ever since high school, when she pored over the Women’s Day Encyclopedia of Cookery and whipped up five-course dinners for her parents, food has been a passion for Goldstein — and "not merely on a culinary level," as she wrote in the first issue of Gastronomica: The Journal of Food and Culture, of which she is both founder and editor. She feels that as we become more sophisticated in our taste in food, we need to become more sophisticated in our discussions about it as well. "Gastronomica aims to renew this connection between sensual and intellectual nourishment," she wrote, "by bringing together many diverse voices in the broadest possible discourse on the uses, abuses, and meanings of food. It’s time that we set a central table for this sort of conversation." Goldstein in her pantry that her husband, Vassar English Professor Dean Crawford, built. Having studied languages at Vassar and Russian literature at Stanford, Goldstein wanted to write her dissertation on food and Russian literature, "because it seemed to me that food wasn’t just used in some symbolic way…it really got to the essence of what many literary works were about." Told that food wasn’t a topic for serious inquiry, she abandoned the idea, but continued to harbor an interest in food. She went on to teach Russian at Williams College and published academic work on Russian poetry, art, and literature. At the same time, she wrote cookbooks, including The Georgian Feast: The Vibrant Culture and Savory Food of the Republic of Georgia (University of California Press, 1999), which won the Julia Child Cookbook Award. Eventually, her desire for a way to integrate her scholarly inclinations and her love of food got the better of her, and Gastronomica was born. Make no mistake, this is not another Food and Wine magazine. Goldstein describes Gastronomica as a "crossover journal" in that every issue has three very scholarly articles, along with many other well informed yet less academic ones. "It’s meant to appeal to a very broad range of people," she said. The inaugural issue featured an exploration of the history of McDonald’s, poetry by Louise Glück, a lengthy discourse on turtle soup, and a sketch called "The Romaines of the Day" (depicting heads of lettuce). Over the course of three issues, clothing, art, industrialization, technology, literature, etymology, film, and furniture have all been explored, all through the prism of food. "I’m trying to show that you can approach any subject through food," she said, "and in depth." While an academic approach was of utmost importance, Goldstein set out to create a magazine that would appeal on a visceral level as well as an intellectual one — much like her cookbooks, which are as renowned for their appearance as for their content. The goal was to design something different from the scholarly journal, "which doesn’t pay much attention to aesthetics," she said. "Food is about pleasure, so you have to have something that is lush and beautiful and makes you salivate or shudder." The simple layout is offset by art that is always striking, if sometimes downright disturbing: In a photo essay called "Food Chain," a worm is seen close-up devouring a tomato, only to be mercilessly gobbled up by a grass- hopper. If the images aren’t always pleasing, then all the better, said Goldstein. "I think that in American food magazines you just have beauty," she said, "you have the finished meal, and you don’t get to the root of where it comes from. Everything has been prettied up for the consumer, and I want to get beyond that. I want it to provoke." Adding to Gastronomica’s aesthetic appeal is the near absence of advertisements throughout the body of the magazine — ads appear only in the very front and back. "That’s important to me," said Goldstein. "I don’t want the ads to interfere with the editorial matter…I want everything to be discreet. In a lot of magazines today, it’s hard to tell which are the ads and which are the articles." While Goldstein admits that relegating ads to the back of the magazine is limiting to potential advertisers, most of the funding is supplied not by advertisements but by two founding partners: the International Association of Culinary Professionals and COPIA, the American Center for Wine, Food, and the Arts. Additional funding is provided by Bertolli USA and Kitchen Aid, two founding corporate sponsors. The product of Goldstein’s attention to all these details is a lush, meaty publication — nourishment for both mind and soul. This is not a magazine to leaf idly through; it’s thick and juicy, inviting the reader to dig in and savor every morsel. Feedback has been overwhelmingly positive; subscriptions have exceeded expectations. Jacob’s Creek winery in Australia nominated Gastronomica for their World Food Media Award after only two issues. Chocolat appeared in the third issue. "She has an inquiring mind and an insatiable love of food," Stark said of Goldstein. And while he eagerly takes credit for her first discovery of arugula ("That gives me an important place in her culinary training," he boasted), he was quick to point out that Goldstein publishes the magazine almost completely by herself. "I have a part-time managing editor," Goldstein explained, "but...mostly it’s just me at my desk." The task of single-handedly editing a quarterly scholarly journal in one’s spare time may seem daunting, but for Goldstein Gastronomica is part of a larger mission. The attitude that once prevented her from writing her dissertation on food has been changing, and she hopes that Gastronomica will help facilitate this change by encouraging people to look at food as a serious field of study. This is in part why having a well-renowned publisher like the University of California Press is so important — Goldstein hopes their reputation will lend credibility to both the magazine and the field. "I think one of the reasons that [food studies] has been looked down upon in intellectual circles [is] because it’s so basic that some people have felt it’s not worthy of intellectual inquiry," she said. "I saw that it was starting to be something a lot of people were addressing, and it seemed necessary to found a journal that would bring greater credibility to food studies in academia." Goldstein’s own academic work has recently taken a culinary turn — she is currently teaching a course on Russian culture through Russian cuisine. The course has the highest enrollment of any she has taught in 18 years at Williams — a sign of progress for food studies. As for her own college career, Goldstein spoke of a seminar on Pushkin her senior year at Vassar with Richard Greg. "He instilled in me a passion for learning," she said. "I can’t see a direct connection between that and Gastronomica, but it’s [about] being open to different modes of expression, and feeling a passion for your subject." There may not have been an opportunity to study food in college, but like any good Vassar student, Goldstein found outlets for her passions outside the classroom. She fondly recalls making treks to the all-night bakery on Raymond Avenue for fresh-from-the-oven doughnuts at 2:00 a.m., and breaking into the Josselyn kitchen late at night in the days before central dining. (She confessed to stealing food, but quickly added, "At least I didn’t steal the silverware like others did!") Her roommate recalled that Goldstein had a toaster oven in her room in which she made — no, not toast — chocolate-chip cookies. As another part of her contribution to the development of the field of food studies, Goldstein hopes that Gastronomica will give her a chance to mentor budding food writers. "If I can help people find a career in food journalism and get them started," she said, "then that’s a wonderful thing — just as exciting as publishing someone who’s already famous." She encourages students seeking a career in food writing to get in touch. Goldstein also hopes the magazine will provide a forum for debate on food-related issues. "One thing Gastronomica does," she said, "is present different viewpoints, sometimes in the same issue." In the first issue, two back-to-back articles examined the global food supply; one was strongly opposed to genetically modified foods, the other argued that biotechnology is the key to solving world hunger. "These two writers couldn’t be further apart politically," said Goldstein. "But I think it’s important that all of the different voices be heard, so that people can make up their minds for themselves." "There’s a plethora of food magazines out there," said Paul Russell, Vassar English professor and Gastronomica contributor, "all of which are entirely and pleasingly superficial, with luscious photographs and pretty thin text. Our national sophistication about food has increased, but our discourse about food hasn’t necessarily become more sophisticated. This magazine presents us with an opportunity to do that. The premise behind it is that thought enhances rather than detracts from the sensual quality of food, or of anything else." Already Goldstein has brought out the latent foodies in her contributors, who until Gastronomica’s inception had never paid much attention to the subject. Stark, who was called on board for his film world connections, now finds himself writing a review of Tortilla Soup, a Mexican-American remake of Ang Lee’s Eat, Drink, Man, Woman, and is keeping his eyes open for more food-related films. "I’m sure I can keep writing about food and film," he said, "which was not previously a big interest of mine but has now become one." Russell, on the other hand, finds that he had always been writing about food and had never been consciously aware of it. "The characters in my novels have to eat," he pointed out. Yes, "We all have to eat," Goldstein concurred. 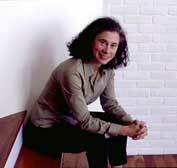 And she has, with Gastronomica, set the table for a serious, thoughtful, provocative, sensual discourse on food. Let all who are hungry come and eat. Bronwen Pardes ’95 is a graduate student and freelance writer living in New York City.